So peanut butter anything basically is a favorite of my husbands. 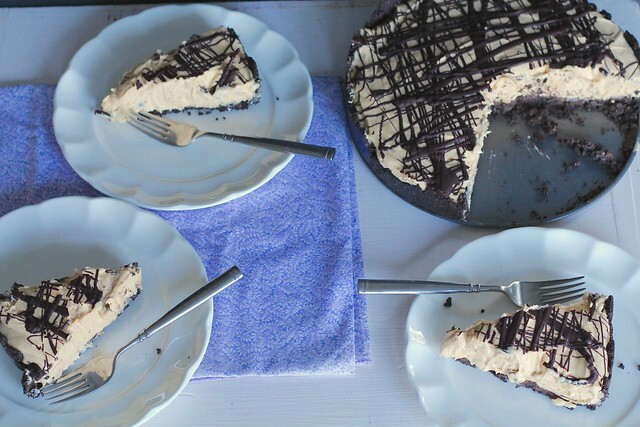 This peanut butter pie is no exception. He requests it frequently. I have no qualm making it! Although, I have a really hard time not eating it all myself. My husband is supposedly a die hard cream cheese hater. But, I think I may be secretly converting him because I sneak it in frostings all the time, and of course in this pie. As long as he can't taste the tanginess of the cream cheese, he'll eat it. 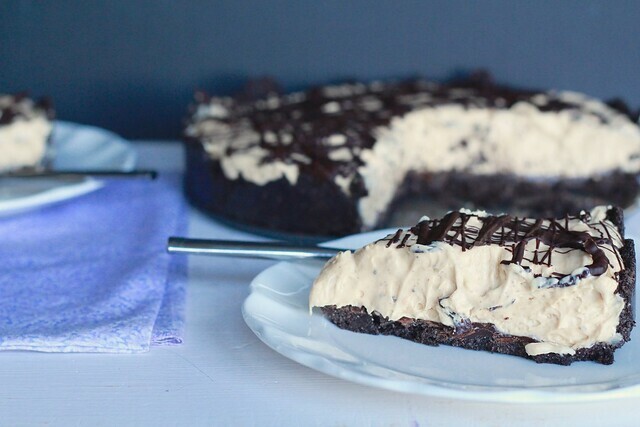 This pie is oh so delicious, and addicting. 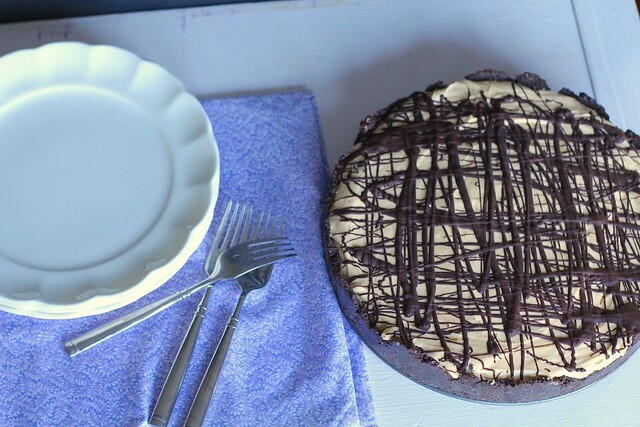 It is creamy, sweet and the perfect peanut butter combination. And having an oreo crust makes it all that much better. I'll take a slice (or two) please! I couldn't even wait the designated three hours to cut into this baby (as you can see by the softness of the pie). I definitely was that excited. Place the cookies to the bowl of a food processor and pulse into fine crumbs. Combine melted butter and cookie crumbs in a small bowl, and stir with a fork to mix well. Press mixture into the bottom and 1-inch up the sides of an ungreased 9-inch springform pan. Melt the chocolate in a double boiler or in the microwave. Pour over bottom of cookie crust and spread to the edges using an off-set spatula. Place the pan in the refrigerator while preparing the filling. Pour the heavy cream into a bowl and beat using a stand mixer or hand mixer until stiff peaks form. Place in refrigerator until ready to use. Place the cream cheese and peanut butter in a deep bowl. Beat on medium speed until light and fluffy. Reduce the speed to low and slowly beat in the confectioner’s sugar. Add the sweetened condensed milk, vanilla extract and lemon juice. Increase speed to medium and beat until all the ingredients are combined and filling is smooth. Stir in 1/3 of the whipped cream into the filling mixture to lighten it up. Fold in the remaining whipped cream. Pour the filling into the prepared springform pan. Drizzle additional melted chocolate on top, if desired, and refrigerate for three hours or overnight before serving.